The three major macronutrients -- carbohydrates, starches and fibers -- supply the body with up to 55 percent of its daily energy needs. Proteins and fats supply the rest. Maltose and sucrose are both forms of sugars known as disaccharides. Disaccharides are created when two simple sugars combine. Maltose is a combination of malt and glucose, while sucrose is a combination of glucose and fructose. Sugars provide the body with roughly four kilocalories of energy per gram. Disaccharides like maltose and sucrose have to be broken down into monosaccharide sugars by digestive enzymes before they can be absorbed through the small intestine and into the bloodstream. 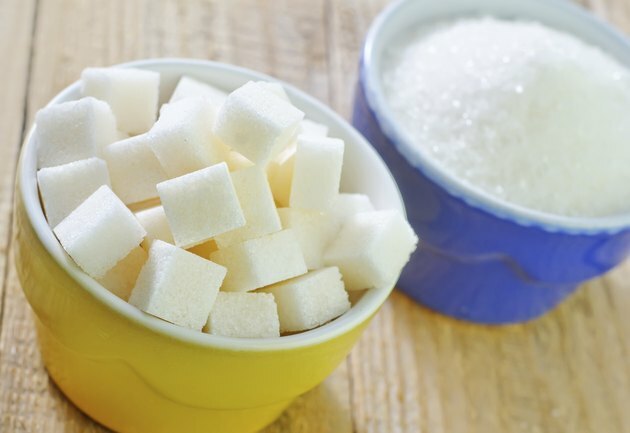 There are many different types of sugars, with sucrose being the most common, maltose being the least common and glucose being the body's preferred source of energy. Sucrose is traditionally used as a sweetener, while maltose, which has one-third of sucrose's sweetness, is more commonly used to distill alcohol. Maltose, also referred to as malt sugar, is the least common disaccharide. Consisting of two glucose molecules joined by an alpha glycosidic bond, maltose’s basic structure is formed from glycogen and starch. It is initially produced through hydrolysis when starch and the enzyme diastase are present. Later, maltose is hydrolyzed by the enzyme maltase, which can be found in the small intestine and yeast, producing glucose. Although maltose is not as sweet as sucrose it is still used as a sweetener. It is most commonly found in germinating grain, barley malt, brown rice syrup and occasionally corn syrup. Maltose is a reducing disaccharide frequently used in the beer-brewing process. Malting, the process of increasing a grain’s starch content by allowing it to sprout roots, creates an ideal environment for diastase, which can convert the starch to maltose. During fermentation, maltose is broken down into carbon dioxide and alcohol. During digestion, maltase is responsible for metabolizing maltose and breaking it down into two alpha glucose molecules. These glucose molecules are then absorbed by the body to be used for energy. If the body cannot break down maltose, diarrhea and excessive gas can occur. Sucrose is probably the most widely used disaccharide. Commonly found in the form of white sugar, it is a combination of the monosaccharide glucose and fructose. Sucrose is a sweet crystalline dextrorotatory disaccharide that occurs naturally in all green plants as a byproduct of photosynthesis. Although all green plants contain at least some small amount of sucrose, it is most predominately found in sugarcane, sugar beet, palms and sugar maple. Once digested, sucrose is broken down by acidic hydrolysis into glucose and fructose so it can be absorbed through the small intestines into the bloodstream. The food industry commonly uses sucrose as a sweetener in commercial products because it is both sweet and functional. Unlike most other disaccharides, sucrose is a nonreducing disaccharide that does not have the same reactive tendencies of other sugars like maltose. This makes sucrose an effective natural preservative, which is why it is often found in jams, jellies and processed foods. However, as people are becoming more calorie conscious, many food manufacturers are switching from refined sucrose to refined fructose, which is about 70 percent sweeter then sucrose. How Is Sucrose Exacted From Sugar Cane?